After fifteen years, Your Humble Columnist is finally about to become Your Humble Author. With this edition of the Leather Life column I am pleased to officially announce my first book: Life, Leather and the Pursuit of Happiness. 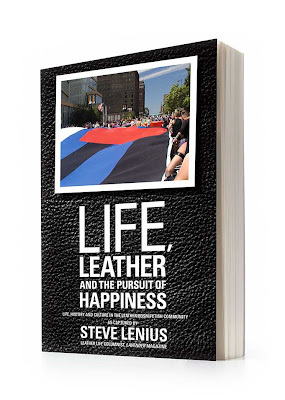 The book, to be published later this spring by Nelson Borhek Press, contains selections from 15 years of Leather Life columns and other writings—112 columns in all, updated and annotated. It has been a rather daunting task to wade through a large accumulation of columns and other writings and try to assemble some of them into a book that flows in some kind of logical order. As I put the book together I tried to pick the columns and other writings that have the most universal appeal, and I grouped columns into chapters around certain themes. The book is divided into two sections. One shorter section is about the leather, i.e. the things that have drawn the community together. The second and more substantial section is about the life of the community and its members as I have observed them over the last fifteen years. As a companion to the book I also am pleased to present the book’s website: <LifeLeatherPursuit.com> (which eventually will replace the existing website for this column, <LeatherLife.net>). I invite you to visit <LifeLeatherPursuit.com> right now—you can find out more about the book, see the Table of Contents, read a few excerpts and even sign up to be among the first to be notified when the book is available later this spring. After the book has been published it will be available at <Amazon.com> or directly from the <LifeLeatherPursuit.com> website.